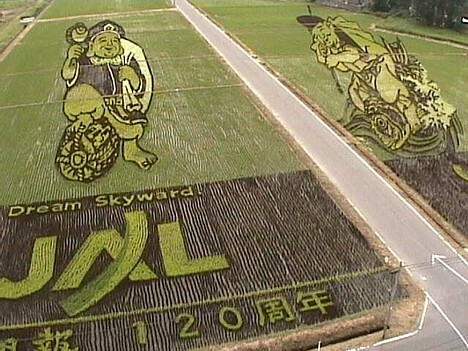 This time-lapse video of the 2008 Inakadate rice crop art is composed of still images captured daily from June 1 to July 3, 2008 via the roof webcam at the adjacent town hall. 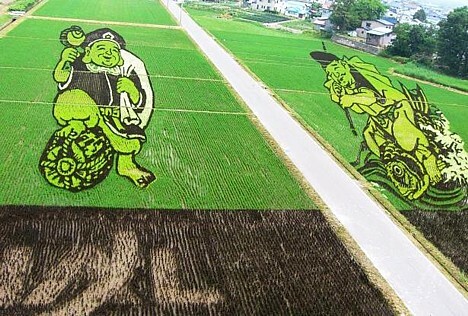 The 3.7-acre work features the images of Daikoku, god of wealth (left), and Ebisu, god of fishers and merchants (right), which were created using five different colors of rice plants. 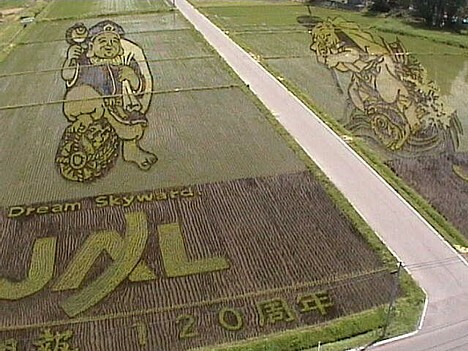 On July 4, just as the crop was beginning to mature, the organizers shut down the webcam when they removed the JAL ad portion of the artwork at the request of the rice paddy owner. 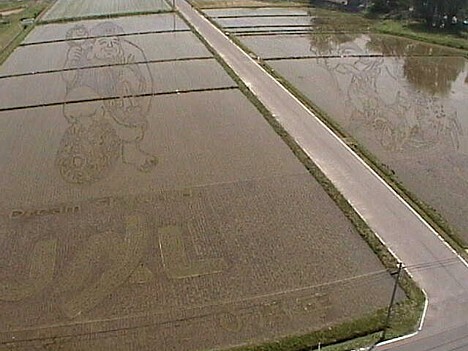 This photo snapped by Aomori-based blogger Pochiko shows remnants of the JAL logo still visible in this year's Inakadate rice paddy art, several days after organizers attempted to "erase" it. 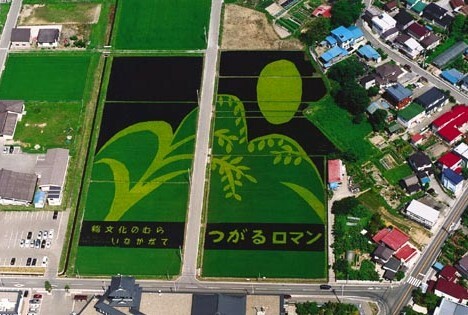 Has Japan Airlines' crop-based advertising gone too far? 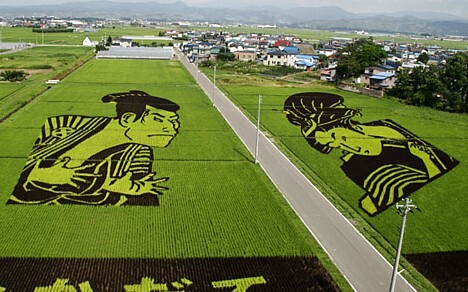 For some residents of Inakadate -- a small town with a big reputation for cultivating fantastic works of multi-colored rice paddy art -- the answer is "yes." 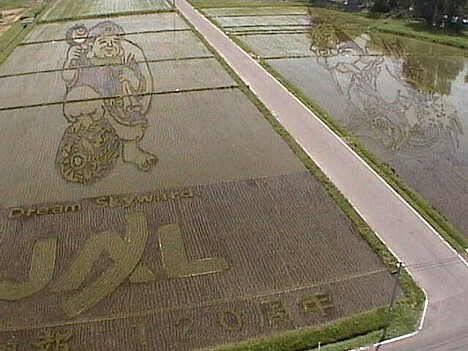 This year's crop art, which is Inakadate's 16th work since 1993, features giant images of Daikoku (god of wealth) and Ebisu (god of fishers and merchants) alongside the corporate logo for sponsor Japan Airlines (JAL). Here are a few photos of the rice paddy taken in June from the 6th-floor roof of the adjacent town hall. 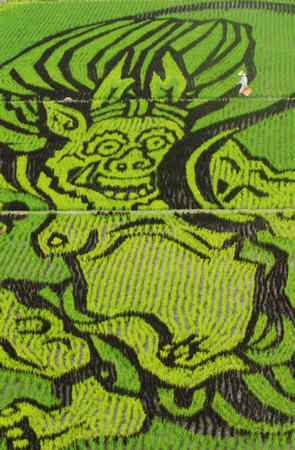 The town committee responsible for the annual crop art project decided to incorporate advertising into this year's work to help offset rising costs associated with increased numbers of visitors. 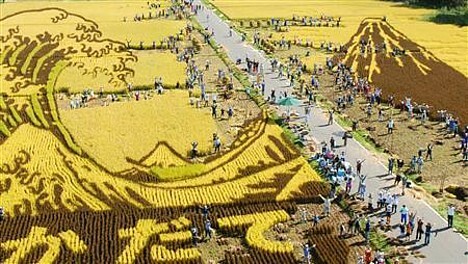 Last year more than 240,000 people came to see the crop art, and many of them used the town hall bathrooms and elevators (there is a nice view of the rice paddy from the roof), resulting in a costly utility bill. 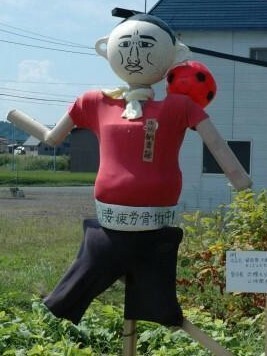 However, the owner of the rice field, Ryuji Sato -- who also happens to be the former mayor of Inakadate and a member of the committee -- thinks the ad stinks. At the end of June he demanded the corporate logo be removed from his property. "The idea has always been to create art that attracts lots of visitors and stimulates the economy," says Sato. "Turning it into a giant advertisement contradicts what we set out to do." 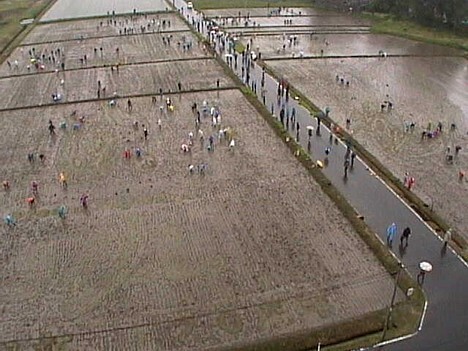 The video shows people removing rice plants only from the area occupied by the JAL symbol, which creates a very conspicuous negative space in the field. Ironically, this makes the logo more visible. It remains to be seen whether they can successfully remove all traces of the ad. Sato's critics are skeptical of his motives. Because he is on the ballot for this autumn's upcoming mayoral election, some believe he is trying to draw attention to his candidacy. Others think he may be taking revenge for the bitter 2004 mayoral election loss that removed him from office. 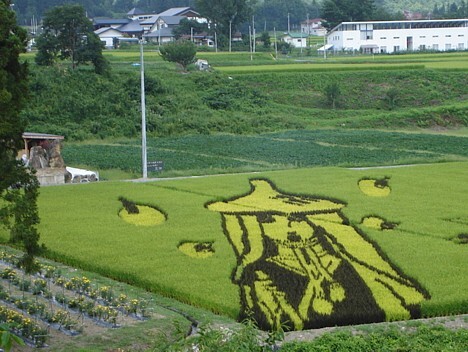 Sato dismisses the criticism, saying that if he really wanted revenge, he would not have allowed the art to be grown in his field in the first place. 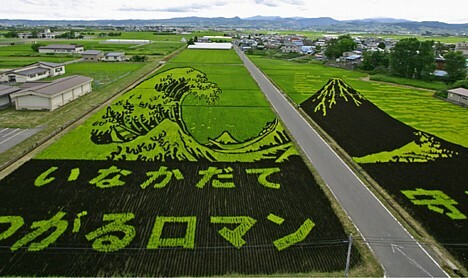 "I just can't stand the fact that they are trying to turn this into a commercial venture," says Sato, who hopes to see the rice paddy art tradition continue as it has in the past. 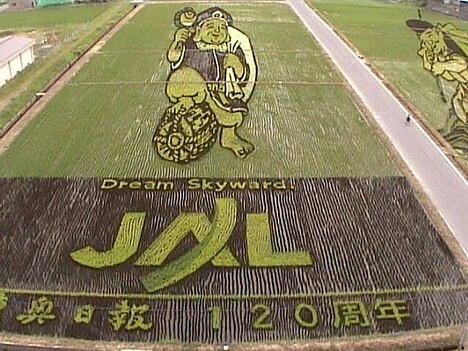 Meanwhile, the Aomori-based marketing agency that coordinated the advertising agreement with JAL does not know what to make of the situation. A company spokesperson says, "We obtained the committee's approval and signed a formal agreement, but yet it has come to this. We are baffled." 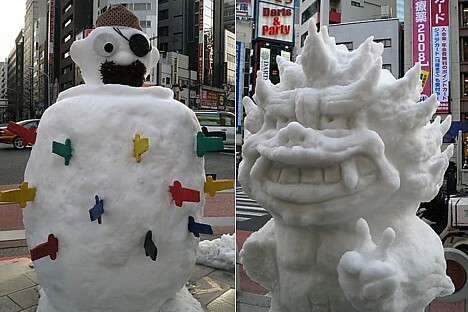 With winter in full force, now is the perfect time to explore the frozen wilds of the Japanese web in search of happy fun snowmen. Arguably the best place to see snowmen is the annual Sapporo Snow Festival, one of Japan's most celebrated winter events. 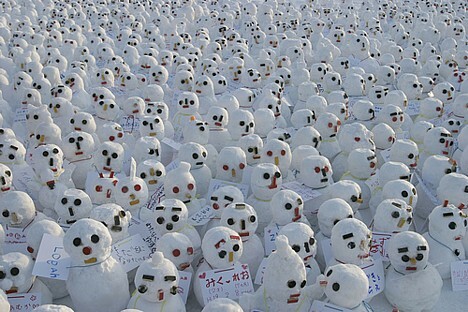 This photo (by Flickr user kozyndan) shows a sea of snowmen (yuki-daruma) built by visitors to the festival, who attach written wishes for good luck. 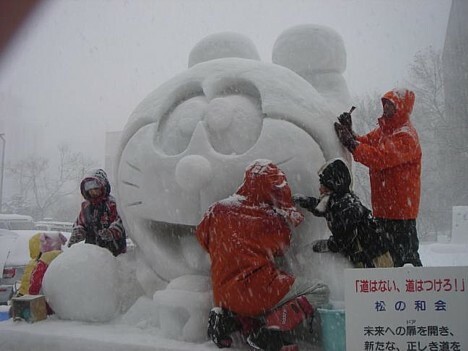 The week-long festival held in early February is home to Japan's largest snow and ice sculpture competition, and all sorts of wacky snow creations can be seen at venues around town -- like this giant chihuahua and Asimo. 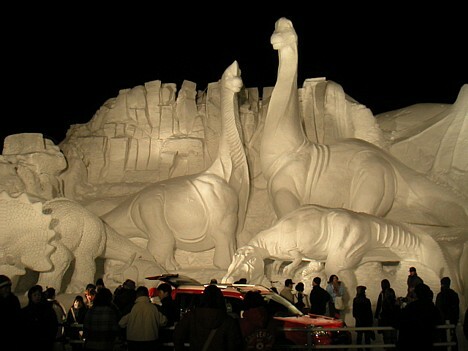 Or much more impressive creations like these dinosaurs. 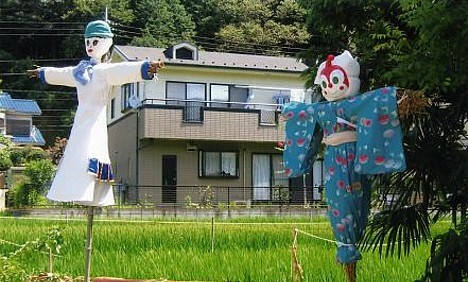 For more pictures from the festival, try a Google image search for "札幌雪祭り" (Sapporo Yuki Matsuri). 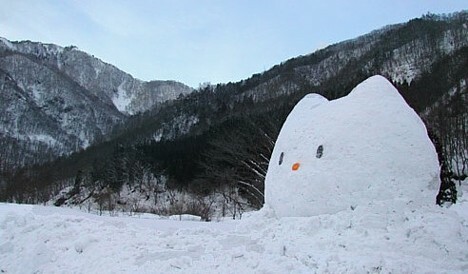 Of course, the Sapporo Snow Festival is not the only place to encounter snowmen -- they appear wherever there is snow. 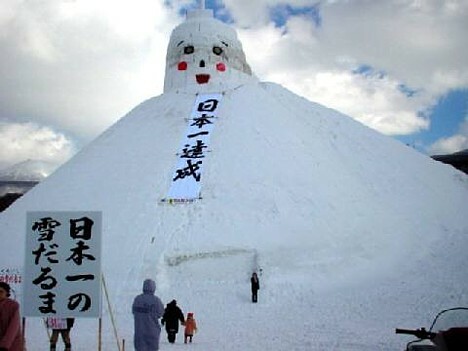 This photo, taken in the town of Kuroishi (Aomori prefecture), shows what is proudly labeled as Japan's largest snowman. 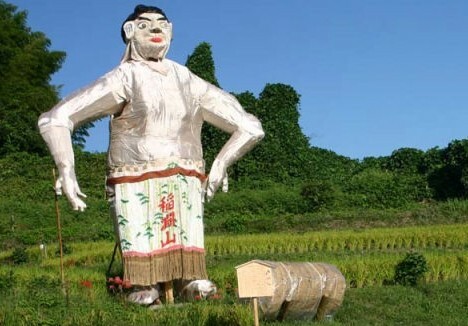 The 31-meter-tall (100 ft) monster has a face composed of local agricultural products, such as charred apple trees for the eyebrows, seashells for the eyes, rice for the cheeks, apples for the mouth, daikon radishes for the ears, and carrots for the collar. 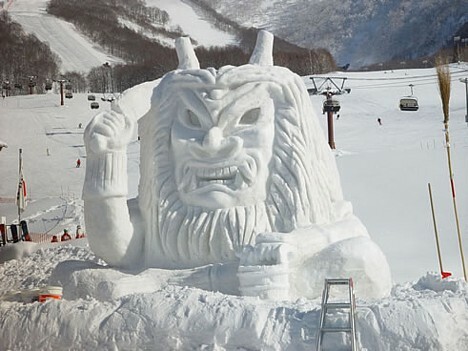 This Namahage folk demon was spotted at last year's Lake Tazawa Snow Festival. 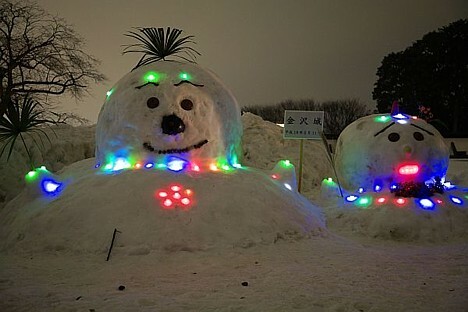 These glowing snowmen were seen standing watch at Kanazawa castle. And this one. Haven't we seen this somewhere before? 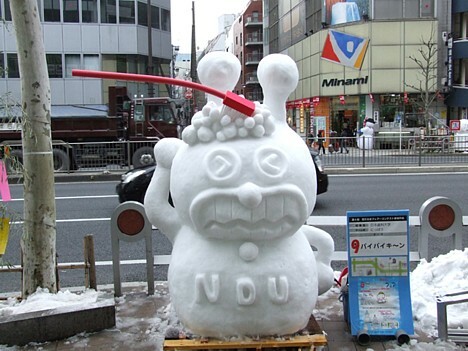 Sometimes happy snowmen can be found where there is no snow -- like in Tokyo. For this year's Kanda Yuki-Daruma Fair in late January, organizers trucked in 70 tons of snow from rural Gunma prefecture and built 30 large snow creatures on the sidewalks of Kanda. 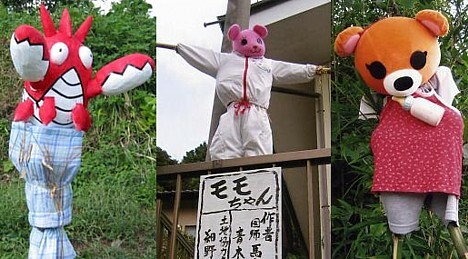 And here are Kurohige Kiki Ippatsu (Pop-up Pirate game) and Shiisaa (a mythical Okinawan creature). For more from the Kanda Yuki-Daruma Fair, see these photos. 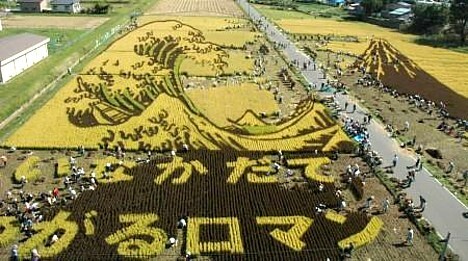 On September 30, about 900 volunteers participating in a hands-on rice farming tour began the annual harvest of the Inakadate village (Aomori prefecture) rice paddy art, which this year depicted a pair of famous Hokusai woodblock prints created with four different varieties of rice. 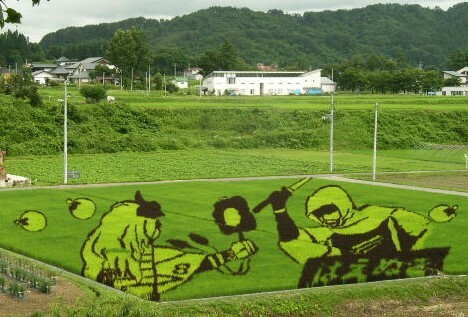 View more photos of rice paddy art HERE. 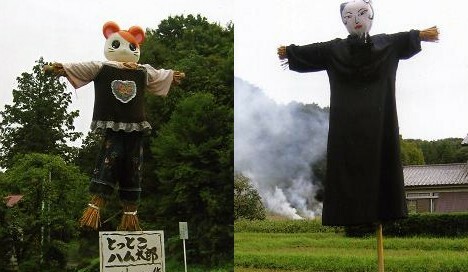 While frightening the birds away, about 60 scarecrows along a stretch of the Route 280 Bypass in Aomori are attracting the attention of passing motorists. 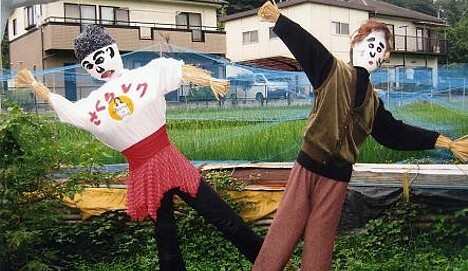 The scarecrow display, which includes one modeled after sumo wrestler Asashoryu scandalously playing soccer (pictured right), is part of Kakashi Road 280 (kakashi means "scarecrow"), a recently established annual September event designed to stimulate the local economy and welcome the 2010 opening of Tohoku Shinkansen Shin-Aomori station. Organizers hope to eventually create 150 scarecrows to watch over the 15-kilometer stretch of road. 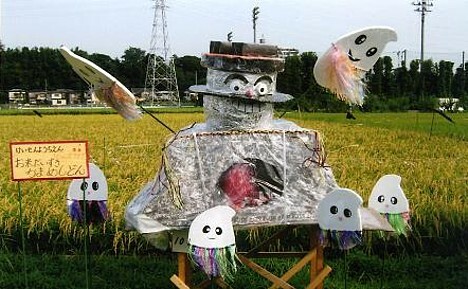 Scarecrows are also known to populate the roadsides in other parts of Japan. 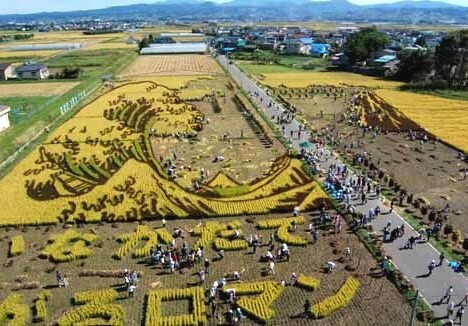 The photos below are from Machida (a Tokyo suburb) and Nara. 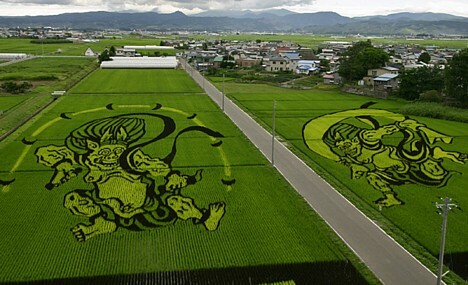 A giant image of Raijin, the God of Thunder, has appeared in a rice field in the village of Inakadate in Aomori prefecture. The different colors consist of different varieties of rice -- the green areas are tsugaru-roman (the local variety), while the purple, yellow and red areas consist of so-called kodaimai, or ancient strains of rice. 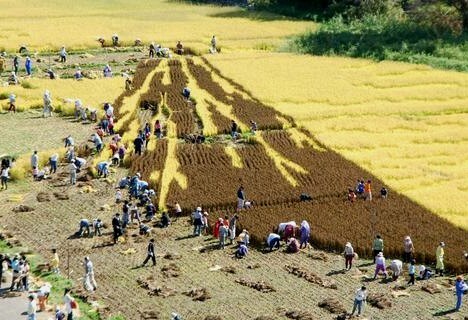 Mid-August is reportedly the best time to view the rice field. Not shown in the photo is the image of Fujin, the God of Wind, presumably located in a nearby field. Fujin and Raijin usually appear together and are perhaps most well-known for their depiction in the Fujin-Rajin Folding Screen (Fujin-Raijin Zu Byobu), an Edo-period work by Tawaraya Soutatsu. The original screen is on display at Kennin-ji Temple in Kyoto and has been officially designated a national treasure.